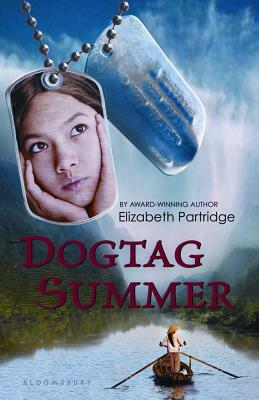 Dogtag Summer by Elizabeth Partridge. Grades 6-8. Bloomsbury Children's, 2011. 240 pages. Review copy provided by publisher for YHBA consideration. This review only reflects my own personal opinion, not necessarily the opinion of the committee! Tracy, a half-Vietnamese girl adopted from Vietnam, has been in America for five years now, but she still doesn't fit in. Tension from the recent Vietnam War lingers in her psyche as she struggles to recover her own memories of her life before coming to the States. Tension from the War permeates her family, too, as her adoptive father struggles to deal with his own army nightmares. When Tracy and her best friend Stargazer find dogtags in her father's tool shed, her father's extreme reaction starts her wondering if the dogtags might be a key to her hidden past. Lush descriptions of the California coast alternate with and compliment lush descriptions of the Vietnamese jungle as Elizabeth Partridge narrates Tracy's present (California, 1980) and her past. The tension between Vietnam veterans and war protesters is shown in Tracy's friendship with Stargazer and her relationship with his hippie parents. The cast of characters - war veterans from Vietnam and Korea, San Francisco hippies - brings an authenticity to the historical setting of the book. There are a lot of issues dealt with in the book: not only post-traumatic stress from the Vietnam War, racism, tension between veterans and conscientious objectors, but also personal issues that Tracy is going through. She's intimidated by starting junior high in the fall. Her mother takes her to buy her first bra (an awkward, but necessary purchase). Her best friend is a boy her parents don't particularly approve of because they have different views than his family's. All of these problems are things that today's tweens are dealing with, and this is very much a story that transcends the historical setting. This dogtag summer is not only about Tracy starting to put together pieces of her past. She also has her first fight with her best friend. She starts to realize that the world is bigger than her own experiences and problems, and she starts to learn why the war was so traumatic for her dad. Even though she lost her family and her home, this was not just Tracy's war. The book includes a pretty extensive interview with the author, talking about the research that she did and answering questions about the Vietnam War. While the book might need some scaffolding about the War, this is a poignant story that teens will relate to; it's about coming of age and feeling in-between in so many ways. I'd not only recommend this to fans of similar stories like Home of the Brave by Katherine Applegate, Shooting the Moon by Frances O'Roark Dowell, and Inside Out and Back Again by Thanhha Lai, but I'd also recommend it to girls devouring Judy Blume's coming of age stories. When I was twelve years old, I would have loved it because I loved the musical Miss Saigon. A note on the cover: I think it's perfect. The river photo evokes both the Vietnam and the California settings. The contemplative face reflected in the dog tags features a face that could definitely be half-Vietnamese. The solitary figure on the river represents Tracy's journey to finding herself. Dogtag Summer is on shelves now!